8th. Edition Available! Now Taking Orders. 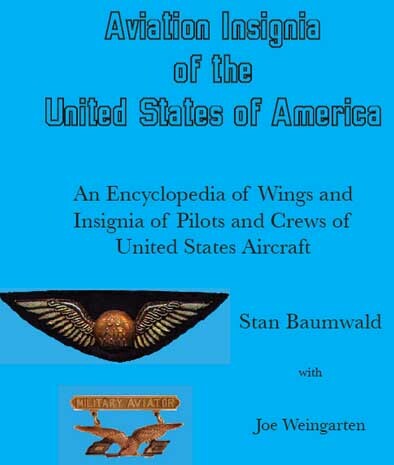 Aviation Insignia of the United States of America is a comprehensive guide to insignia of badges and wings of aircrews of the American aviation. The guide has wings from over 1000 airlines, fixed operators, and other agencies. This edition adds about 25 more wings and as always, we correct for typos and found a few more. Over 3900 wings in color are shown representing almost every airline in the US. A brief overview of various government agencies and US Military wings is also provided. Badges for aviation started in 1913 when the US Army issued the first badge to it pilots. Only about 3 dozen were made as they believed that would be enough forever. WWI found nations committing large air armies and the pilots coming home continued to fly and soon airlines came into being. The fledglings got a big push by from the Post Office to provide faster mail delivery and the US Air Mail wing was that worn by many commercial pilots. Airlines have come and gone, merged and thousands of flights happen every day. All the pilots and crews proudly wear their wings, so it fitting to provide a reference of most of them. Making this the most complete book ever issued on this type of insignia and the only reference of it kind for the collector or those interested in aviation. Conditions of sale: Buyer pays $65.00 which includes postage and handling for media mail shipment within the United States. Will be happy to autograph the book if requested. Price $65 includes free shipping.